...when I can escape the dinner dishes and spend time simply watering the flowers. 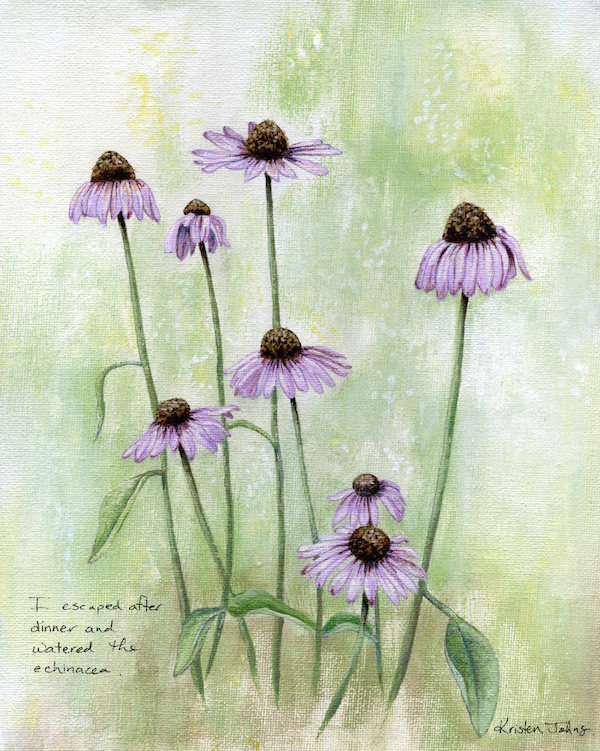 I'd much prefer to stare at the echinacea bobbing around in the lazy evening sunshine and leave the dishes and the busyness of the household behind. I'm having fun with this change in my painting for now and thought I'd try another one with the acrylic paints. Hope you like it! This original 8 x 10 painting is available in my shop ($95 USD). Acrylic paint on canvas board. Thanks Sera - you're always so encouraging :) I've been using a large brush and a rag to make the background. Also, I've been really watering down my paints so they go on as a wash... I can't completely depart from watercolours I guess! I love your work, first saw 'last year's daisies topped with snow' in taproot and was hooked (its still my favourite). I had to comment to say I do exactly this - escape after supper to water plants, often one of my favourite times of day, amazing how that after dinner hour calms kids and they often have their best play of the day. Beautiful work. Thank you for sharing what you do. Thanks so much Gloria! The best part about art is how it connects people together. I'm so glad you left your comment and I'm so happy you just "get it"!